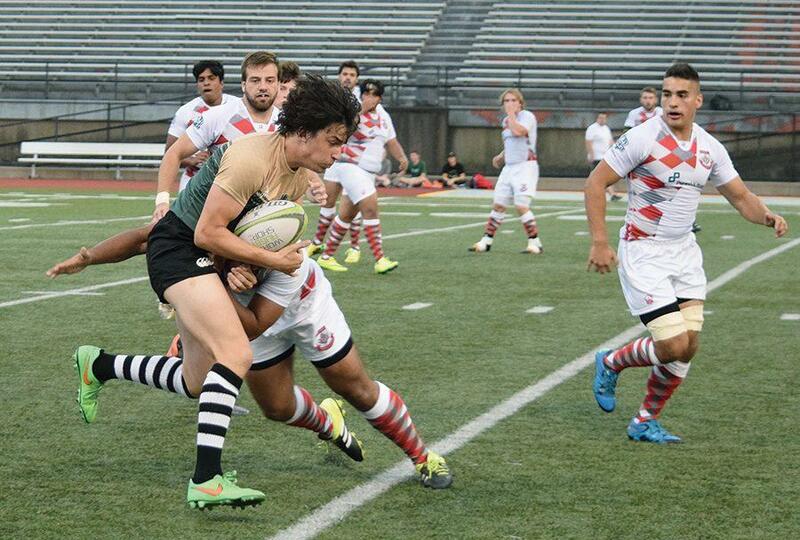 Sophomore flanker, Elliott Carr, tries to push forward against CMU on Saturday. Point Park lost the match, 35-5. If you were to describe rugby club president Elliott Carr most accurately in one word, it would be unconventional. Professional would come in at a close second. The newly elected rugby club president for the 2016-17 school year has big plans that he hopes come to fruition, including a new women’s rugby club initiative. Despite entering only his sophomore year, his teammates and mentors agree that he has the pairing of a specialized drive and an innovative mind to transform the club from a team into a brotherhood. Carr, a biology major, feels that he fell into the presidency in a sense, claiming he felt he thought he lacked the extroverted nature that being president of such a large, successful club would require. That somebody was Jakob Como, last year’s team captain, who Carr bonded with on and off the field. Despite Carr’s newcomer status last year, Como recognized a distinctive ambition in the freshman. “I know Elliot has the perfect mix of drive and personality to continue to grow the club and accomplish more than every president before him,” said Como, who graduated in the spring. Aside from reuniting the closeness within the club and kick-starting a female club, Carr is focused on two objectives: recruiting new members and getting the team to playoffs. Carr considers his focus on recruiting this year more prevalent than past presidents’ efforts. Carr himself was recruited for the club during the annual activities fair last year. This year, he was the one behind the rugby table, this time as president, getting signatures from students and inquiring about interest in a women’s club, something he’s determined to spearhead. Teammate and Rugby Club Secretary Brady Winner agrees that forging the path for a women’s club is doable, especially with someone like Carr in the presidency. If there’s anyone who knows Carr’s character, it is Winner. The two locks were inseparable during games last season, both playing the same position hip-to-hip and in the scrum. While the club isn’t hyper-focused on having a perfect record, Carr hopes this year will be the team’s best, thanks to an average of three practices a week, foreseeing more weekend tournaments and eventually playoffs. “We do care about our record, and we have high hopes to make playoffs this year,” Carr said. Aside from being an organized and optimistic president, Elliott proved himself to be a promising player and athlete last season, winning “Man of the Match” during the very first game he ever played for Point Park against Robert Morris University. Although Carr said the philosophy of rugby is innately community-driven, his individual performance in matches did not go unnoticed, including during a match Winner recalled last season against University of Pittsburgh Johnstown (UPJ). Aside from rugby, Carr is focused on figuring out his future; something he’s unsure of, but knows will undoubtedly involve serving others. Carr, a trained Emergency Medical Technician (EMT), sees rugby in his future as well; claiming he never wants to stop playing as a way to stay in shape and have a brotherhood he can count on well into adulthood.